Have you got the right gear to tackle Via Ferrata? Photo: Alex Messenger. Climbing Via Ferratas is exciting, challenging and popular. The winning combination of new “iron ways” being put up across the Alpine regions, and safe, modern equipment means that more people are having a go each year. But don’t be fooled by appearances - you still need to know what you’re doing and have the right equipment for the job. Via Ferrata are routes through what may often appear to be inaccessible ground, opened up by the placing of metal rungs or footplates and protected by a continuous wire cable. This cable may also be used for your hands, (for those who don’t want to use the rock, or in wet and slippery conditions) but it is usually just clipped into for your protection. A Via Ferrata may be horizontal, vertical or indeed anywhere in between and can involve both ascent and descent. There is a popular myth that the routes were created in wartime for positioning guns, but most date from attempts in the infancy of mountaineering to equal out the grade of popular alpine ascents. These days a whole range of routes is present from roadside attractions to serious mountain adventures. To get started on Via Ferrata you need standard alpine walking gear, plus a helmet, gloves, and a comfortable harness. The harness can be a sit harness (with chest harness if you feel the need) or a full body harness. And attached to the harness is the single most important piece of equipment specific to Via Ferrata - a purpose designed energy-absorbing lanyard. This is essential. In the past people have used ordinary slings clipped to the wire cables for protection, but this gives potential for very high fall factors (up to 5), which can cause catastrophic equipment failure. The danger of such a high fall factor cannot be stressed enough, since in normal climbing situations the greatest fall factor you’d encounter is 2. There are a number of modern lanyards on the market, produced by Mammut, Camp, Petzl and Simond amongst others. A Via Ferrata lanyard consists of an energy absorber, two arms which connect to the cable with karabiners, and a means of connecting to the harness. The energy absorber can be rope or tape running through a friction brake, or a block containing tear-out webbing. Without this energy absorber a fall might cause serious injury or death. Lanyards should meet the EN958 standard, but they can also meet UIAA 128, which is an optional higher standard. Modern lanyards use a “Y” tape configuration, and offer protection if both arms of the lanyard are clipped into the cable. However you may come across earlier models using a “V” shape. “V” lanyards were the first to be developed but suffer from a major limitation - it’s essential to only be clipped into one arm if you fall. If both arms are clipped onto the cable and you fall, the energy absorber won’t work. In fact, clipping the spare arm into anything can lead to disaster. So if using this type, take extra care when moving past an intermediate anchor point. Some lanyards also have a short third arm, which allows you to rest on steep sections. Whatever you choose, make sure you read the instructions. Type K or Klettersteig karabiners must be used on the ends of the lanyards. Check there is a K for Klettersteig in a circle on the spine of the krab - if there is an H in a circle it is an HMS karabiner for belaying, and is not designed for Via Ferrata use. Type K karabiners are made specifically for Via Ferrata - they have a wider opening than normal, and have a self-closing mechanism. Those meeting the optional UIAA standard must pass additional strength tests, which simulate forces likely to occur in a Via Ferrata fall. Watch out if you’re taking younger kids out too - they may love the climbing but their hands can be too small to operate the Klettersteig karabiners properly, or they may lack the grip strength required for repeated operation. Check this before setting off and keep a sharp eye out en-route. As these routes are essentially man made they can and do fail, and should be treated with the same caution as any fixed equipment in the mountains. A brief visual inspection should be made as you travel over them and keep an eye out for any obvious signs of wear: badly rusted or loose ladders, loose cable anchors etc. Bear in mind that the ladder rungs in particular are subject to wear from passing climbers and in combination with extremes of weather do occasionally become bent or loose. Even though the routes are generally technically straightforward, there are a couple of other points to bear in mind, especially if you are in a mixed ability group. Firstly, there can lot of arm work involved, and on harder routes it’s possible that less strong climbers may become exhausted and be unable to continue. Start with some of the easier Ferrata, try to pick routes that are within the ability of the whole group, and always make sure an experienced climber, instructor or guide is with you if there are doubts. Consider employing a top rope for steep or difficult sections if someone isn’t too confident. The style of Via Ferrata varies with location. Some are almost roadside adventure playgrounds, others are full on days in the mountains requiring thousands of feet of ascent and descent. Before heading off, take time to think about your planned adventure. Dan Middleton is the BMC Technical Officer. This issue’s equipment expert is Ian Fenton. Ian Fenton was BMC Youth Officer, who is now back instructing and coaching in the UK and Southern France. He is especially keen on all forms of Via Ferrata. See www.mountfenton.com for more details. Q. What’s the best way of attaching my lanyard to my harness, should I use a karabiner? A. No. Most modern lanyards have a sling, which you larks foot around your harness belay loop. This is secure and introduces no extra weak link to the safety chain. It also reduces movement of the textile parts during a fall which could cause melting. Q. I’ve got a friction brake at home, can I make my own lanyard up? A. You could make you own set up with some spare dynamic rope and a brake, but choice of rope diameter and correct configuration are vital. And with ready made systems including specially designed spring loaded Klettersteig krabs, costing as little as £30, there’s really not too much incentive for a DIY job. Q. Do I need a back-up rope? A. Remember, a lanyard will not prevent a fall, so depending on the Via Ferrata and the participants, a rope and a few slings may prove invaluable. A tired, injured or scared climber can be safely belayed through any difficult sections. This equipment will also help out in the event of coming across a damaged section of cabling, a real possibility if you’re the first party up that season. Q.. What sort of harness do I need? A. Either a full body or a standard sit harness. Most climbers will just use their existing sit harness. But a full body harness will help prevent you being flipped over if falling with a pack on - and is also recommended for children. One option is to buy the harness as a complete system with a self belay set. Complete sets of varying sophistication are available in many shops. Q. How hard are Via Ferrata? A. The main guidebooks use a two tier grading system. Technical difficulty goes from 1 to 5, and seriousness from A to C. Hence an easy short route in unthreatening terrain would score 1A, whereas a long, hard mountain route would weigh in at 5C. As a rough guide most confident scramblers should be happy jumping on a 3B and above. Q. What boots should I wear? A. Approach shoes have the edge when it comes to comfort and actually climbing the routes, whilst you’ll be thankful for a beefier boot on long scree descents. It’s going to be a compromise either way. Your choice will also be dictated by the amount of snow cover. Want to know more about the equipment used for climbing and mountaineering? Our range of advice guides are full of useful information for experienced climbers and novices alike. We cover the different types and uses of equipment, the standards they must adhere to and detail essential care and maintenance tips. Do you have some spare time and energy on your hands? Do you want to give something back to the climbing and walking community? 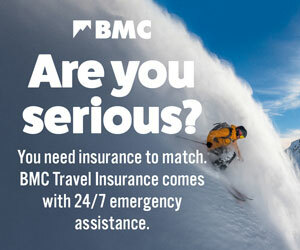 If the answer is yes, then the BMC needs you! Online climbing gear: are you buying safe equipment? It's becoming common to shop online rather than take time out from our busy lives to physically visit a shop. The convenience, range of choice, and often better prices, make buying online incredibly attractive. But don't be caught out: there are some nasty surprises awaiting the unwary! Check your history ,there are many types of vf. Old climbing routes , modern sport routes and routes erected during ww1 these are in the main in the Dolomites.